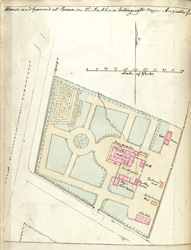 Pen-and-ink and wash plan of Major Augustus Grafton's house at Pune (Poona) in Maharashtra. This is one of 95 drawings (90 folios), chiefly of landscapes and monuments in the Deccan, West India and Afghanistan, made between 1821 and 1844. Most of the drawings are by George Boyd (1800-1850), however the book also contains drawings by A. Grafton, two maps by A. Christie (perhaps Alexander Christie, assistant surgeon in Bengal, 1825, and surgeon from 1840) and three sketches by Dr. Rupert Kirk (1806-52, assistant surgeon and surgeon 1830-52 and in Afghanistan 1839-40 with the 1st Grenadier Regiment, Bombay Native Infantry). During the 18th Century, Pune was the capital of Raja Shivaji, the Maratha king who defied the Moghul emperor Aurangzeb. However in 1802 Jaswant Rao Holkar defeated the combined armies of the Peshwa and Scindia. As a result of this defeat the Peshwa invited British assistance and Pune was occupied by troops under Wellesley in 1803. After the battle of Kirkee in November 1817 it was surrendered to the British who based the summer headquarters of the Government of Bombay here and established a large military cantonment.